Sam Molloy and Alex Downie on how you get by when you’re struggling to be someone else’s safety net. 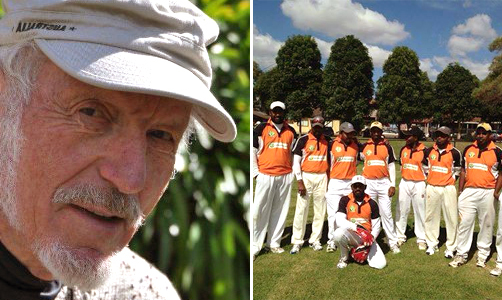 George Winston, Secretary of the Blue Mountains Refugee Support Group; and Ocean 12, a cricket team formed with the help of the Group. In 1941, when George Winston was seven, he and his mother were stopped by the SS at a checkpoint between his mother’s work and their lodgings in the Jewish ghetto in Lwów, modern-day Ukraine. Any Jews stopped there were immediately taken to a transit camp outside the city, and then to the concentration camps. George’s mother pleaded with the officer in fluent German that she had always been a lover of German music, literature and drama. She attempted to convince him that her son was not Jewish. “In the end Mother had only one weapon left: ‘Haven’t you got a wife and children?’ He said: ‘Yes, I have a boy and a girl. Go on, run away!’ and we took off as fast as our legs would carry us, hearts pounding”. The next year, George and his mother narrowly escaped to Romania as stateless refugees, and after eight years they made it to Australia. Thanks to the community’s support and his own tenacity and drive, George went to university and had a long and successful career as an electrical engineer and entrepreneur. In 2001, he was a founding member of the Blue Mountains Refugee Support Group and today, aged 81, he is the group’s Secretary, helping to support over 1000 refugees every year throughout Western Sydney. Since the group’s founding, it has grown to 660 members, making it the largest community group of its kind in Australia. Because government services are, as George describes it, “very patchy” and “grudging”, the group does everything from visiting detainees at Villawood, to coaching a cricket team in Katoomba for Tamil men who are “going crazy with boredom” because they are banned from working under their Temporary Protection Visas, to providing emergency financial support for families who find themselves teetering on the edge of homelessness and hunger. Much is rightly made of the treatment of those who reach our shores and are locked up in camps on client states in the Pacific Islands, by a government so ashamed of its own barbarity that it continues to prosecute whistleblowers who report instances of physical, sexual and psychological abuse. But refugees living in the community also receive inadequate support from the government. In the absence of a safety net, there exists an ad hoc network of community groups, non-profits and contracted organisations. George is “happy to carry on” working with refugees. Because of his early background, he “still feels like one of them, so while I am healthy and strong, I just keep going”. But for “the people who do it long term, it’s tough”. The burden adopted by the volunteers and private organisations that step in where the government has failed is one of the silent hardships brought about by our nation’s treatment of refugees, as well as a story of resilience and incredible care. Virtually none of the regular members of the Blue Mountains Group are trained social workers or psychiatrists. Yet as George tells me, they often find themselves adopting the role of mental health workers, working through the “long term, gentle process of healing to nurse people back to normality”. One member of the group has housed Aziz*, a young Tamil man who suffered extreme trauma during years of persecution in Sri Lanka, and then years more locked in our camps. When Aziz was released into the community he couldn’t cook an egg for himself or leave the house. Because of inadequate mental health services, the Blue Mountains Group found themselves stepping in to provide him with care and support. Only after months of support was Aziz recovered enough to go to the local shops by himself. Volunteers from community organisations like the Blue Mountains Group do valuable work, but there are serious questions about the strain placed on the untrained volunteers who step up to act as de facto psychologists and social workers. ‘Vicarious trauma’ is the term used to describe the impact on mental health caused by regular contact with people who have experienced trauma. Recent research has indicated that the brain wave patterns of those who work with trauma survivors often comes to mimic the patterns of the survivors themselves. One of the greatest fears for many organisations is that their own workers will come to suffer from mental illnesses brought about by their work. Community organisations operate with little funding, and can struggle to find effective means of helping their volunteers. Some require their volunteers and members to undergo training with STARTTS, an organisation that offers training for other organisations on how to appropriately assist those who have experienced trauma, and how to reduce the risk that their workers develop secondary traumatic stress. You have to ask yourself whether that basic training is sufficient for those dealing directly with refugees. After all, even those who work for professional organisations with far more extensive protective strategies struggle to manage the trauma they experience. Vicarious trauma is common amongst professionally trained social workers and psychologists in every field of work. Standard coping and monitoring strategies to shield workers include things like mandating time off, and requiring caseworkers to attend regular meetings with psychologists. Even then, there is relatively little research about how effective those current strategies actually are in protecting against vicarious trauma. The best organisations can do is monitor the number of sick days their employees take and institute self-reporting standards for caseworkers—these ad hoc measures are the extent of their safety net. The particular struggles of vicarious trauma in the refugee sector are clear in the difficulties faced by the psychologists contracted by the Salvation Army to work in detention centres on Nauru and Manus Island. While writing this piece I discovered that the psychologists are required to spend an equal amount of time off the island resting as they spend on the islands working. The policy was put in place after it became clear that, despite all their training, the psychologists were struggling to cope with the stress of the work. A source close to the process told me that even with the policy in place, many of the mental health professionals who had worked on the islands for any extended period of time now suffer from depression or severe anxiety. Like the other strategies to cope with trauma, there doesn’t seem to have been any real effort to measure how effective ‘down time’ might actually be. Professionals working with refugees on the Australian mainland face many of the same challenges. Settlement Services International is a not for profit organisation contracted by the government to be the first point of contact for refugees when they arrive in Australia or are released from detention into the community. They’re the people that pick you up from the airport, drive you to your new apartment and explain how the country works. On average, SSI’s 180 caseworkers are each responsible for assisting around 40 refugees. All of SSI’s caseworkers have tertiary qualifications in social work or psychology, and SSI has extensive reporting and monitoring strategies to help their employees handle the mental stress of their jobs. Many of the problems faced may not seem like a particularly unexpected result of working so closely with people who have escaped extreme trauma. But the trauma, for refugees and for the people who help them, has been made a great deal great worse by the political race to the bottom over the last two decades. The jobs of people working on the ground were made especially difficult by the constantly shifting policies of the Rudd-Gillard-Rudd-Abbott era, as each sought to outdo the other and appear tough on refugees. RACS was one of many community legal organisations that lost nearly all of its government funding when significant cuts to community legal services were made in the 2014 federal budget. Despite losing about 85% of its funding, RACS remained afloat thanks to community donations and ad hoc government contracts, but it has ceased to provide ongoing representation to any clients, and many of its staff have been forced to spend their time fundraising. The funding cuts also created extra stress and uncertainty for RACS employees and volunteers, who stood to lose their jobs when the cuts were announced. In a climate of government inaction and neglect, community groups and social enterprises are increasingly stepping up to deliver services that the government does not, even extending to professional training. The Bread and Butter Project was set up by the Bourke Street Bakery to train refugees to be bakers and assist them to transition to fulltime employment in the baking industry. Kayleigh, the Project’s Trainee Manager, explains that while there are difficulties in monitoring and maintaining the mental health of staff and trainees, the work is incredibly rewarding and can help to balance the potential stress of the job. The project recently graduated a class of new bakers and expects to take on a new cohort of trainees in the near future to provide with the professional training they need to gain a new career in Australia. They hope to provide an example for more private organisations to provide a platform for refugees to build new lives in Australia. While these enterprises do give refugees something of a safety net they beg the question—why are they the ones doing it? That refugees have to rely on the kindness of a commercial bakery for job skills, or for caseworkers to have to spend time fundraising rather than helping their clients, speaks volumes about our national ambivalence towards refugees. The most startling consensus that emerged among social service organisations I spoke to is that over the next decade, the focus of their work with refugees resettled in Australia is likely to be the trauma caused by our government’s own detention centres. The original trauma that caused these people to flee their homes is in many cases only secondary to the damage done by their time in detention. George told me that when he stepped off the boat in the Port of Melbourne on the 7th November 1950, “Australia opened its arms, and it’s been a good 65 years”. When future Australians eventually reflect on this period of our history, we can only hope that they might be able to see some sliver of redemption in the sacrifice and dedication of community groups manned by workers like George, who have persevered through government cuts and personal stress to help those who arrive on our shores in desperation, pleading to call Australia home. Alternately, email your local State or Federal MP to lobby for better government services.